GreensandPlus directly oxidizes sulfide and catalyzes the oxidation reaction. Increased run length and service life of GreensandPlus may be realized by pre-feeding a solution of chlorine-containing compounds. Regeneration with chlorine should be initiated before the complete exhaustion and sulfide is detected in the treated water to prevent damage to the media. 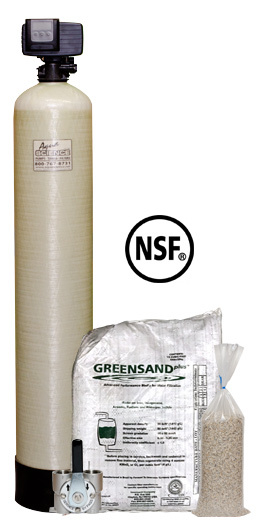 GreensandPlus can be used to remove arsenic from ground water in the presence of iron. Chlorine must be pre-injected to oxidize the iron and convert arsenite to arsenate and keep the media regenerated. Arsenic combines with oxidized iron and is filtered out in the media. If there is not a sufficient amount of iron present in the raw water, then an iron salt such as ferric chloride can be pre-injected. A general guideline is 1 mg/L of iron to remove 20 µg/L of arsenic. This can vary greatly depending on pH, silica, and other competing ions in the water. GreensandPlus can be used to remove radium from ground water in the presence of manganese, in a similar manner to arsenic removal. In the case of radium, manganese in the raw water is necessary. If there is not a sufficient amount of manganese present, then manganese sources, such as manganous sulfate can be pre-injected.